Visiting Russia’s Golden Ring, from Suzdal to Pereslavl-Zalesskiy, was one of the top things we wanted to do whilst visiting Russia. The Golden Ring is a circle of small cities and villages outside of Moscow to the North, which are famous for their beautiful churches, old history and provincial way of life. I embarked on this trip in 2013 during one of the coldest springs on record for Russia. The weather was almost off putting but in the end I appreciated my travels all the more as the villages looked so idyllic covered in thick white snow and dotted with peasants traditionally dressed in furry hats and boots. We hired a car from Hertz in Moscow. Hiring a car in Russia is cheap and petrol is even cheaper. We set off at about 12-midday and arrived in Vladimir (Владимир) at 3.30pm. We were starving when we arrived and made it our first priority to find something to eat. We went to a small restaurant specialising in fish near the main shopping centre on Dvoryanskaya street, which had a cosy wooden interior and we ate pickled herring and fish dumplings with sour cream. Whilst dumplings are a traditional staple of Russian cuisine they are not usually made with fish, but this twist on a classic was delicious. We then wandered around the town centre and came to the Golden Gates, which were originally built in 1164 and restored at the end of the 18th century. The gates were originally built at the western entrance to Vladimir to both decorate and protect the city but today they are merely for show, as cars are no longer able to drive underneath. Past the gates we walked up to the Water Tower. We wanted to climb to the top of the tower to see the gorgeous views of the city, but the old grandma’s working there said we had come too late. The tower normally closes at 5pm, and at that time it was 4.35pm but the grandmas had already started mopping the floor. Next we made our way to the main attraction of the city, the Assumption Cathedral. This was founded by prince Andrey Bogolubsky in 1158 and is situated on a hill top and is one of the most important examples of ancient Russian architecture. In fact, architect Aristotel Fioravanty studied the design of this cathedral extensively and built a replica of it in the Moscow Kremlin. Whilst the cathedral is very beautiful, we were put off by the number of beggars that surrounded it. When we first approached, a homeless man and his pregnant girlfriend began to follow us. They eventually had the courage to approach us and asked for some money. It is common for beggars to wait outside of churches for alms, because church-goers are most likely to give money. However you should only give a very small amount, like 5 or 2 roubles. We gave them 40 roubles and they were so overtaken by our kindness that they continued to follow us as we made a tour of the interior of the cathedral, hoping for more money. We decided we should best leave, and as we made our way to the car another beggar started following us too. As soon as we got inside the car we had to lock our doors, because the beggars continued to speak to us, and we sped off to our next destination Suzdal. By the time we arrived in Suzdal it was getting dark. We walked around the outside the Kremlin, which looked magical as the sun went down and the sky and snow turned beautiful shades of pale blue and purple, however it was freezing! The temperature was around -13C. We then searched for accommodation. 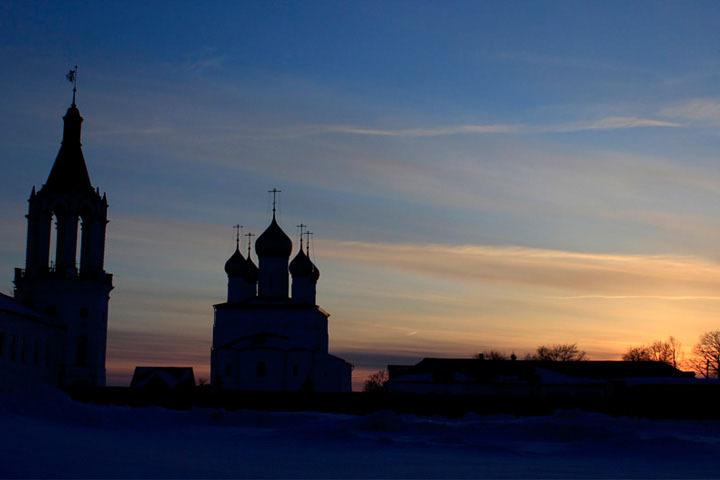 Suzdal is one of the most popular places to visit on the Golden Ring circuit and hotels are expensive. However thanks to some advice from a friendly local we managed to find a real gem and spent the night at a State run monastery. The place stirred many memories among my Russian companions of former times under the Soviet Union. We needed to fill in several Soviet-style forms to register and the rooms were solemn and bare. It was a real experience staying here because the monastery was beautiful from the outside and had a magnificent wide staircase leading from the main entrance inside. It was also very cheap! Our room contained an interesting book of “damage costs”. If you break a glass, it will cost you 50 roubles. If you destroy the curtains it will cost you 200 roubles. If you destroy the bed it will cost you 300 roubles. The most expensive thing to break was the toilet, which will cost you 800 roubles. You could have a lot of fun breaking stuff in this room as long as you were prepared to pay. On the recommendation of the staff, we took a short walk around the corner to a small restaurant and bar that stays open till late. We ordered a selection of different snacks to share including olives, fried potato (kartoshka), fried fish, and dumplings, and we drank some red wine before going back to sleep. We woke up at 10am ready to explore Suzdal (Суздаль). Suzdal looks like it belongs in a snow globe, it is just beautiful. We went to a cafe outside of the Kremlin for an interesting breakfast. I had Slavic crepes, a typical Russian recipe where the crepes are prepared with fresh honey, butter and sour cream. 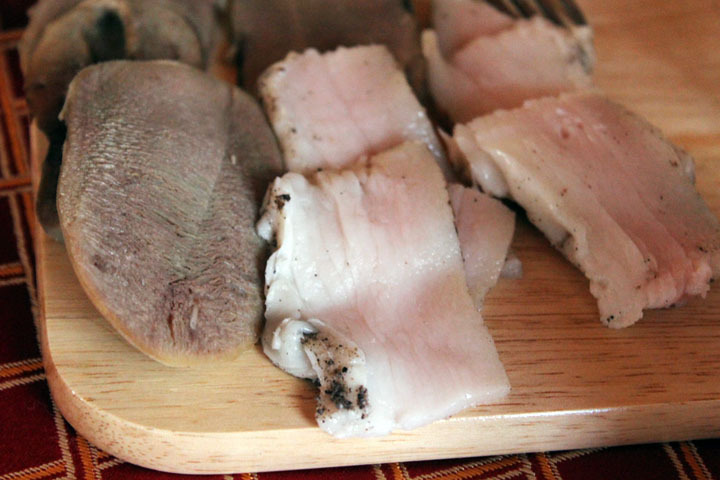 My companions ate cold sliced cow’s tongue with pork fat and black bread (lots of calories as you can imagine). We then went for a ride on a horse-drawn sleigh through the town centre. A young boy put thick fur coats on our knees so we stayed warm during the ride and chatted in Russian about the highlights of the town. Nobody we met in Suzdal spoke any English. One of the most interesting facts the boy told was that the big hills in the area were actually man made during the 12th century, by digging up the ground around it, in order to act as a wall to protect the city. The ride was very enjoyable and it was worth the 300 roubles we paid per person. We then went inside the Kremlin. 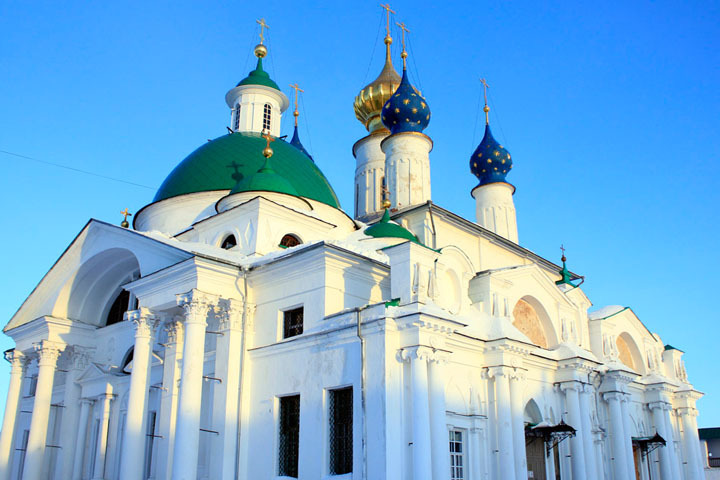 Kremlin (Кремль) means castle in Russian and it is the historical centre of Suzdal. Inside the Kremlin is the famous Rozhdestvenskiy Cathedral, which is the oldest Cathedral in the area and it has a royal blue dome with gold stars on it. Like most Orthodox churches, it is richly decorated inside. All the walls are covered in paintings that depict important people and events from the New Testament framed in gold. 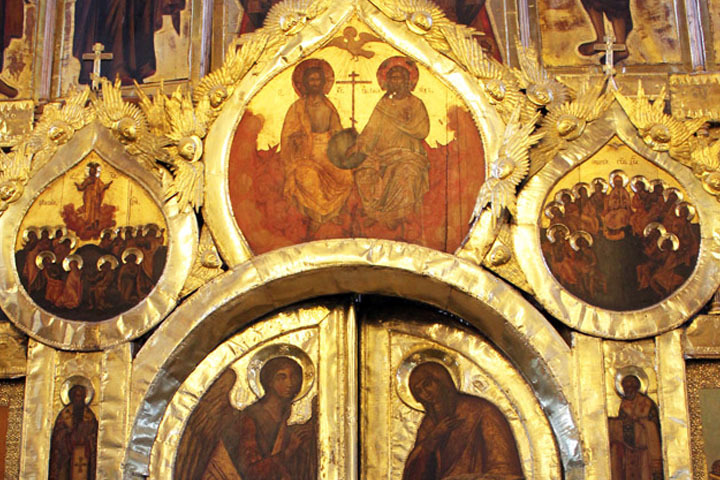 I particularly loved the pictures of the Cherubim, who are the second highest order of angels. According to the bible a Cherubim should have four faces; a man’s face, an ox’s face, a lion’s face and an eagle’s face, as well a four corresponding co-joined bodies. They are the protectors of the Garden of Eden. In this cathedral they were only depicted with one animal face and body, but correspondingly on the central door that protects the altar there was depicted four saints each with one of the holy components of a Cherubim: an ox, a lion, an eagle and also a small man. Connected to the cathedral are the Arkhiereiskie chambers and the Krestovy chambers, which were built between the 16th and 18th century and were used to celebrate special events. Next we visited the Museum of Wooden Architecture. Despite the boring name, this museum is worth a visit as it recreates how people lived during the 16th century. You can visit the houses of peasants and merchants, see where they worked and kept animals, see how they stayed warm in winter, and also how they had fun. It also had two big impressive windmills that are still in use. As you can guess, pretty much everything is made of wood. I shudder to think how people lived in these wooden buildings all those years ago during freezing cold winters when temperatures were as low as -20C. Just like all those books by Tolstoy and Chekov that depict peasant life, I saw that peasants really did sleep on the stove in winter. All the buildings are original, exactly as people would have lived in them, but they came from the neighbouring town of Vladimir and were transported to Suzdal specifically for the museum. We walked back to the town centre to visit the trading arcades, where locals sell hand-made crafts and delicacies.It was the perfect place for us to buy souvenirs as the prices were cheaper than in Moscow. You cannot bargain at these markets because the price is already very cheap and the town’s people are honest. I bought two matryoshkas, a Russian doll, two fridge magnets and some hand-made Christmas decorations. After exploring Suzdal we hit the road again and headed to Kostroma (Кострома). Even though it is only 191km away it took us almost 4 hours to get there. 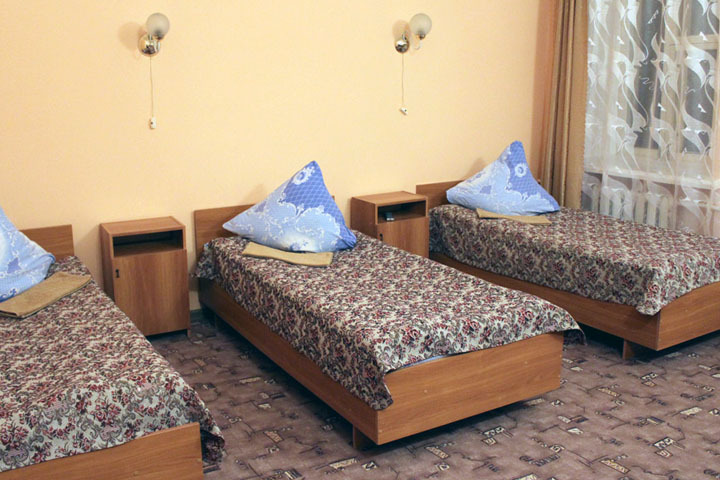 We rented a little cottage for the night at a complex called Berendeevka. 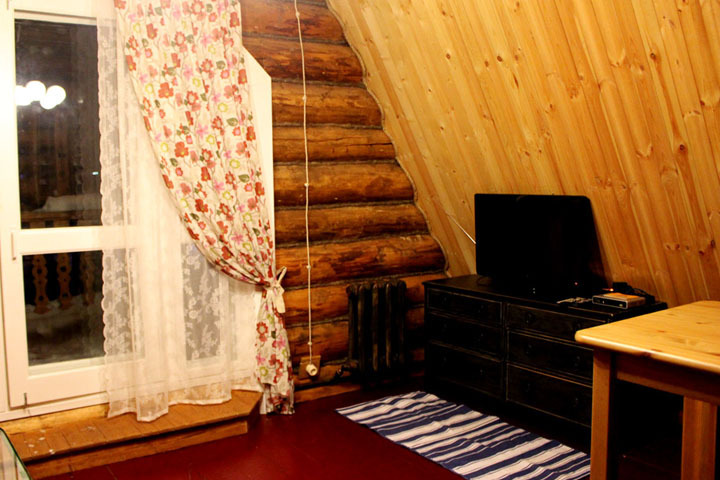 It was a wooden cottage that was homely with modern facilities and reminded me of an Austrian ski chalet. It consisted of a bedroom with a double bed and armchair, a living room with a couch that folds out into a bed, two armchairs, a table and a TV, and a modern bathroom with a spa bath. There was also a little kitchen corner with a bench with stools for dining, and kitchen appliances. Of course there was a balcony too to enjoy the lovely view or have a cigarette. It only cost £42 for all three of us to stay here. We decided to go to the local shop to buy some delicious goodies and spend the night in. Everywhere in Russia (except some certain places in Moscow) you can only buy alcohol for take-away before 10pm. By the time we had got ourselves unpacked it was already 9pm so we jumped in the car quickly to get to the nearest shop in time. We bought a small loaf of white bread, some brown bread rolls, Lithuanian sliced cheese and cottage cheese, cold smoked mackerel, smoked salmon, ham, and some red and white wines. It was interesting for us to discover in the supermarket that most of the best dairy and grocery products in Russia actually come from Lithuania. As we enjoyed our snacks back at the house we watched Russian music videos on TV. The Russian music industry is huge, and millions of dollars are spent making video clips that are very polished and professional. A lot of the video clips will depict a story, and musicians and extras always have amazing hair, make-up and fashion. MTV could learn a lot from the Russian music industry! 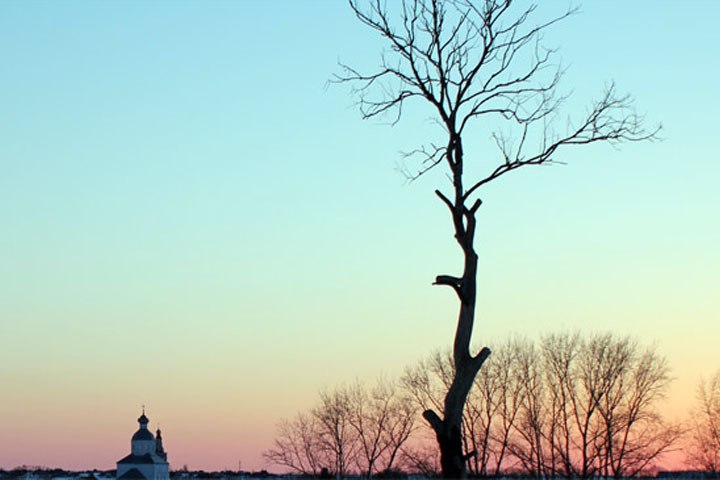 We woke up early the next morning to check out Kostroma. This is the city where the famous Russian classic A Cruel Romance (Жестокий романс) was filmed and the city centre looks exactly as it does in this movie. 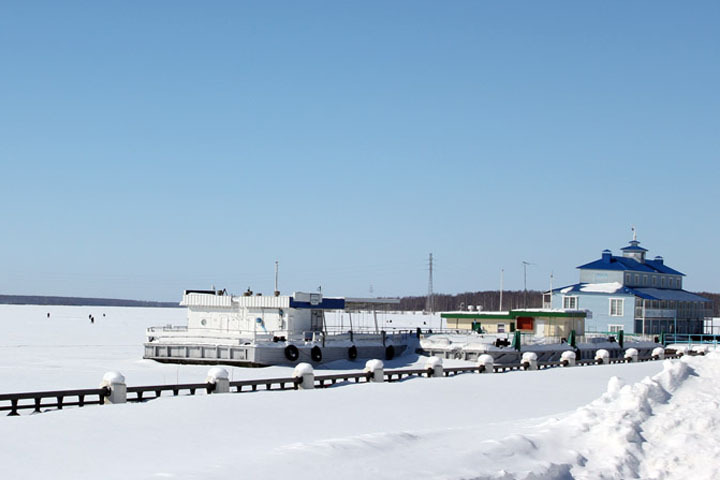 We walked down to the Volga river where a lot of the main scenes took place on the pier. The Volga is the most famous river in Russia and it has been an inspiration to many poets, writers and artists. The river was completely frozen over at this time of year. The most famous statue of the city is three blocks uphill from the Volga and it is of a Russian peasant named Ivan Susanin (Иван Сусанин). According to the legend, Ivan is a hero. During the winter of 1612, the city was invaded by Polish troops. The troops asked Ivan for directions and he led them to a dangerous swamp to protect the city from capture. The Polish troops killed Ivan for misleading them, before dying themselves in the swamp. However many Russian people are cynical and believe the real story to be different. They say that Polish invaders came to Kostroma searching for Moscow. They forced Ivan to show them the way to Moscow, and as Ivan was a stupid peasant who had never been outside his village and was also scared for his life, he tried to show them the way but ended up getting them all lost and killed! Either way, this statue is very grand and it has become a representation of how the Russian people are prepared to sacrifice their own life in order to save their country. The statue is at the entrance to Susanina square, which is the hub of Kostroma. 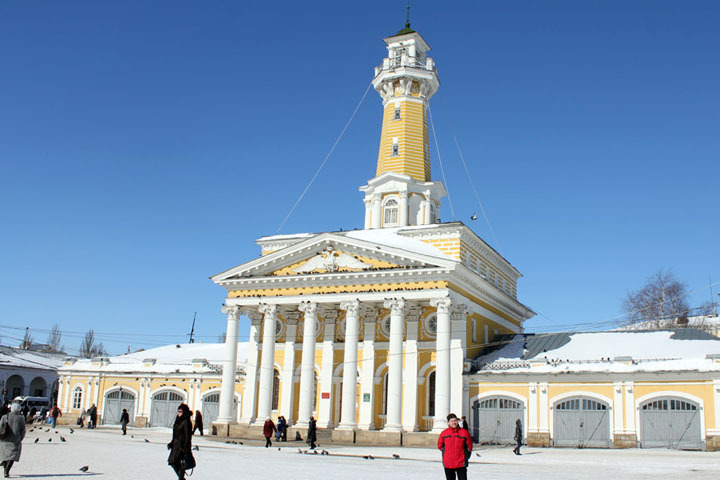 The square is white and yellow and has trading arcades, which mostly consist of farmers selling fresh fruits, vegetables and produce, as well as stalls selling hand-crafts and Russian trinkets. On the opposite side there is a fire tower and military guard room as well as a chebreki house. Chebreki (Чебуреки) is a popular Russian snack often sold at train stations, and is basically a fried large moon shaped pastry filled with different meats, vegetables or cheese. The town centre of Kostroma has a happy and busy vibe. After spending a pleasant morning here we then headed to Rostov Velikiy (Ростов Великий). Rostov is famous for the archaeological discoveries made here. The history of this place dates back to 4000 BC, when the first Finn-Ugor tribes settled near the lake. They lived here until the 11th century, when they then began to slowly assimilate with the Slavic people from the south. Archaeologists have discovered ancient tools used by these prehistoric people. 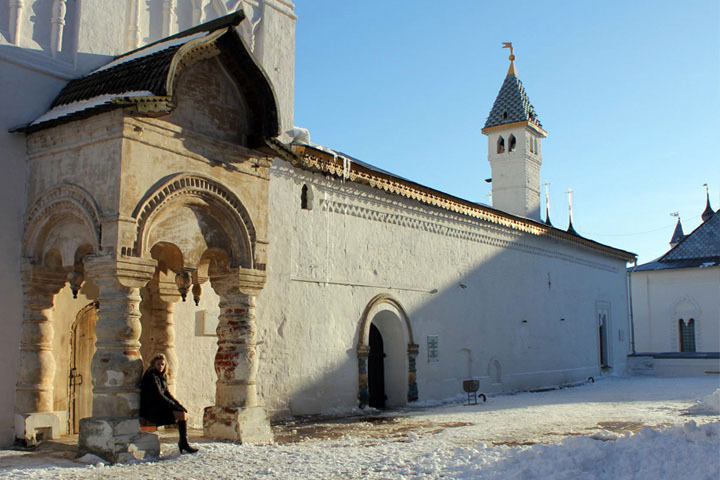 Like Suzdal, the Kremlin is the historical centre of Rostov. However unlike other towns, the main purpose of this Kremlin was to accommodate the local head of the church (rather than protect the city). It is beautifully decorated. The majority of buildings in the Kremlin were built around the 17th century and it is divided into three parts: the Cathedral Square, the Bishop’s Court and the Metropolitan Gardens. The main Cathedral in the Kremlin is called the Assumption cathedral and it has wooden domes made from lots of little pieces of wood so it looks a bit like fish scales in that classic onion bulb shape. In the gardens there were lots of bird nests as well as an ice-skating rink for the local children. Behind the gardens there is a staircase you can climb that leads you to a rooftop area from which you have a great view of the Kremlin. There is also an archaeology museum here. Down the road from the Kremlin is the huge Rozhdestvensy monastery that is still working and where over 20 monks still live. In recent times the monks have raised a lot of money from the local community to restore the buildings and in the summer they do gardening. There are lots of photographs of the activities of the monks on display. There was a mass occurring at the church. Women need to cover their head when entering an orthodox church (even if a mass is not taking place), so I wrapped my scarf around my head when I entered. The interior was richly decorated with gold and paintings and a choir of women were singing from a balcony on the second floor. They sang so perfectly in unison at a high unnatural pitch, it reminded me of the music they plan horror movies about evil children. After the mass we continued our exploration of the ground and discovered the monastery also has a bell tower that you can climb up to and see a great view of the city. We then drove to Pereslavl-Zalesskiy (Переславль-Залесский) to have dinner. Originally we wanted to try an interesting-looking restaurant called Bamboo that looked very busy inside. However upon entering we discovered the waiters were Chechens and so were a lot of the customers. My Russian companions felt uncomfortable to be there. For those of you who do not know, Russia and Chechnya have been at war for hundreds of years. Chechen’s are nationalistic and they want independence from Russia and ownership of their lands. However Russian’s believe that Cechnya’s do have autonomy and believe that Chechens just like fighting. It is hard to know who is right and who is wrong, but it is a well-known fact in history that between 23 February to 9 March 1934, Stalin loaded all the Chechen’s in Russia onto trains using false promises and sent them off to Middle Asia (mainly Kazakhstan). This was an absolutely cruel and outrageous act. We crossed the road and went to a hotel restaurant called Provincia in Pereslavl-Zalesskiy instead, although I would have much rather dined at Bamboo because this restaurant was completely empty. Although the waiters were very friendly but we found the food to be average. I ordered crepes with caviar and the crepes were slightly burnt yet cold with hardly enough caviar. My companions ordered pork stew with mushrooms and potato’s served in a pot as well as fish with potato’s, peppers and sour cream. It had been a long day and as we drove back to Moscow I had a well-deserved nap in the car. I really enjoyed our mini road trip around the Golden Ring, however we needed more time. 3 days is just not enough and we spent quite a lot of the time driving. I would recommend a minimum of 8 days to visit all the cities, with Suzdal and Rostov as definite highlights.